So I'm going through my house, replacing the switches and came across this switch that controls a fan in my bathroom. It looks like this may have been something the previous owner did, and did incorrectly. If you notice, there is this strange coiled wire looped around the terminals. The wire itself appears to be stripped in the middle for the terminal connections and continues with the tip exposed. This looks bad and I think should be fixed. In the bathroom, the light switch controls power to this switch, so the light switch must be on to use the fan. I assume that the wires from the light switch, go to the light, then to the fan. From the fan, I believe the hot splits off and goes to this switch and back. There is no ground in the box for this switch. The problem itself is not that big of a deal for me, just an annoyance. Besides having the ends exposed, is using this coiled wire a hazard? Should there be a ground wire with the switch? Should it be replaced with standard 14 gauge wire? Any other concerns that may stand out based on what I described? Probably the best thing I can do is to replace it and make the fan independent of the light. This just puts a lot of work on my end as I only want to update the switch, for now. I have other plans to get an electrician to add circuits to my house at some point, just not anytime soon. I'm a little afraid to pull it out as I believe the wires will not stay in place/can bare any weight without dangling. Here is a different angle of the switch, you can see the majority of the box. 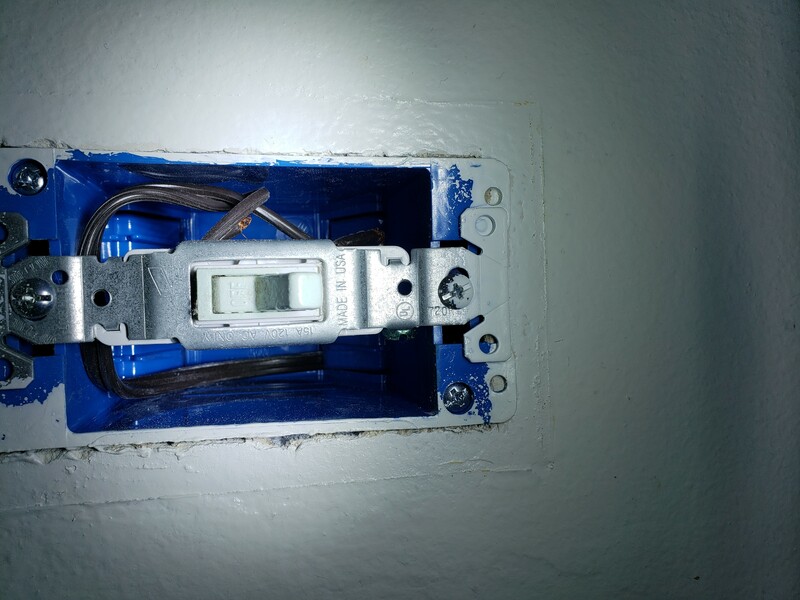 Whoever installed this lightswitch used the first thing they could get their hands on, apparently SPT-2 parallel cordage of some sort, instead of NM cable. As a result, there is no ground in this box at the moment, nor is their a neutral, which is now a requirement to provide at switch locations to accommodate smart switches and such. As a result, the entire cable that connects this switch to the fixture it controls needs to be replaced with a 14/3 NM cable -- black goes to always-hot in the vent-fan box, red goes to the vent fan hot, white goes in with the neutral bundle that the fan connects to, and bare goes to the ground bundle. In the switch box, bare goes to the green ground screw on the switch, black goes to one switch terminal, red goes to the other switch terminal, and white simply gets capped off with a wirenut as it's not used for a "dumb" mechanical switch that simply sits in the circuit hot and breaks it. This sort of sloppy work in one place means one thing: that there's probably more trouble lurking where you cannot see. Do not be surprised if you see more flagrant Code violations during further work. 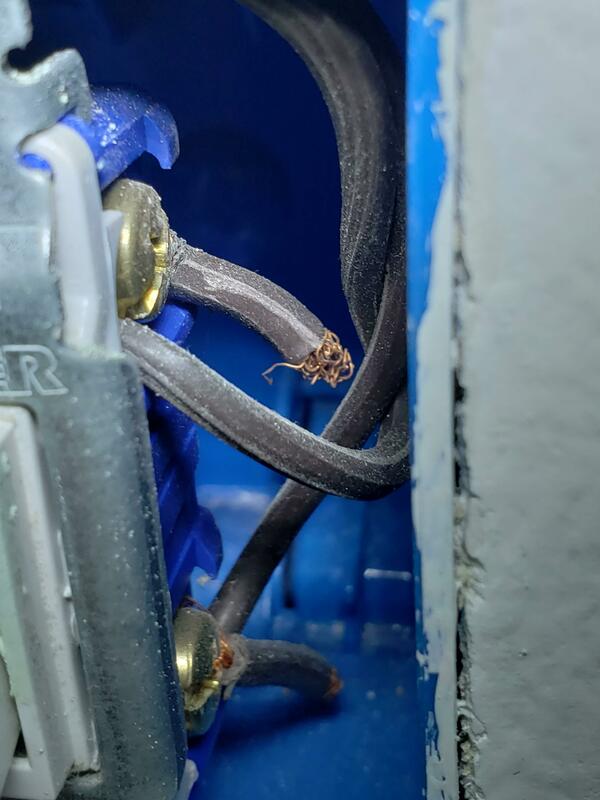 If you have a friendly electrician at hand, you may wish to call them in and go on a Code-violation scavenger hunt through your house with them, even. It looks like someone has used lamp cord here. It should be pulled out, and redone with Romex, or whatever is legal where you live. I'm a little afraid to pull it out as I believe the wires will not stay in place/can bare any weight without dangling. What's the recommended procedure for converting a single circuit light switch into two switches for controlling a bathroom fan? How do I wire a light switch and outlet in the same box? Is a wire coiled around a post adequate for grounding light fixture bases?